A celebration for Dr. Seuss! 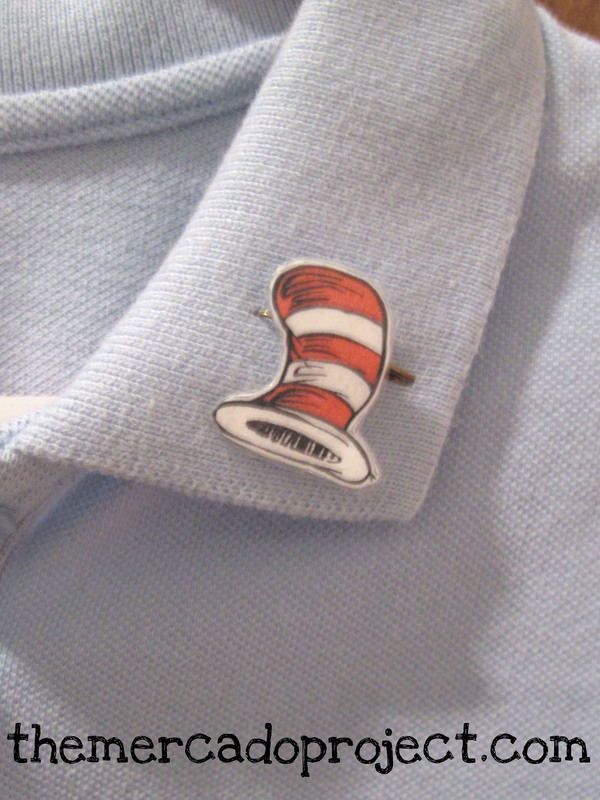 Did you know that it’s Dr. Seuss’s birthday tomorrow? It’s also my mom’s! She’s going to be 61 years young, but she’s reversing things and saying she’s going to be 16! 🙂 More on that celebration later on. My daughter’s school is having a celebration today for Dr. Seuss and she was super excited. Last night, I gave her some time on my computer so she could explore www.seussville.com while secretly I was making her a little pin with the hat from the Cat in the Hat for her school shirt. I thought about this so last minute so I was hustling around the house trying to figure out how to make a pin. This is what I came up with. I found this image of the hat on AOL search, then printed it out. I taped it onto card stock to make it sturdier and the tape gave it a laminated look. I found the smallest safety-pin I could find in my house and taped it to the back of the hat and pinned it onto the collar of her shirt. I surprised her in the morning by helping her into her shirt and saying, “go take a look in the mirror.” She instantly saw it and loved it. 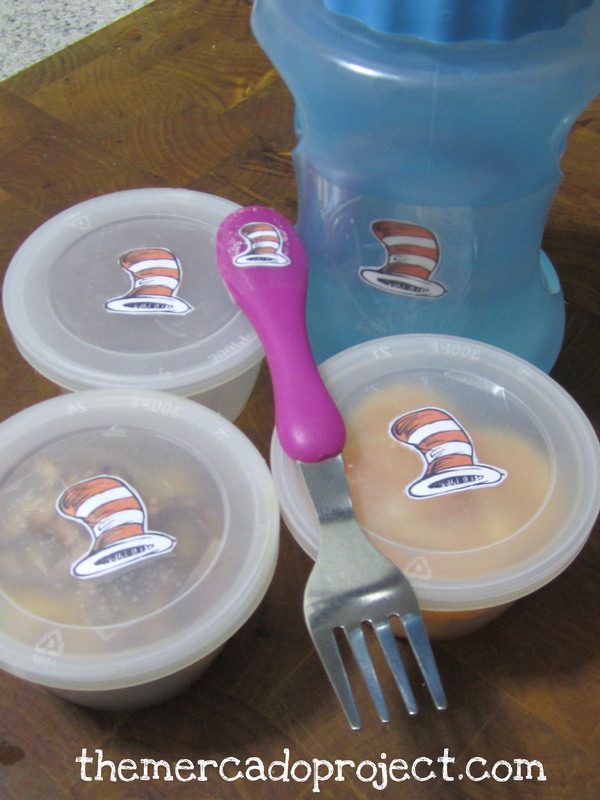 I also printed out several of the hats because I wanted to tape them onto her lunch containers and give her another surprise when she had lunch at school. I taped the hat onto her water bottle, fork, sandwich container (not shown), and veggie, fruit, and snack containers! 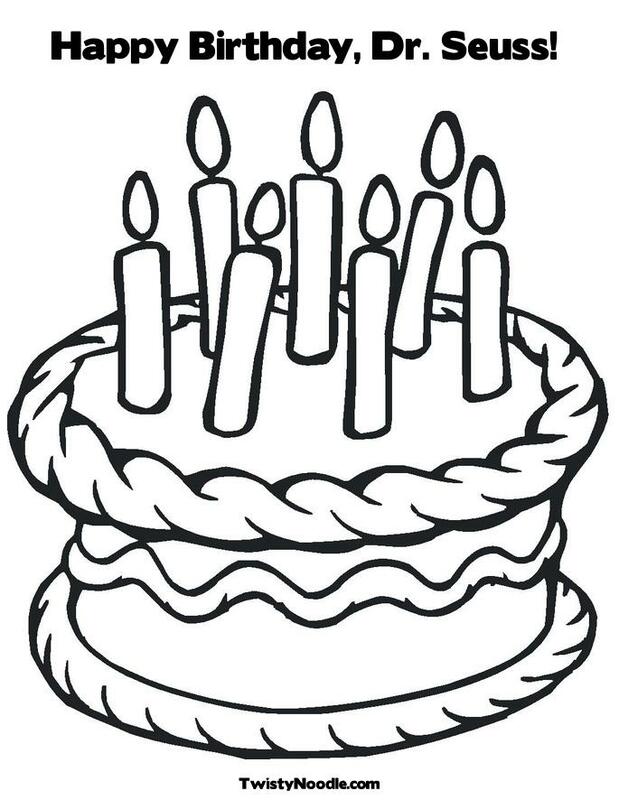 I found this coloring page also on AOL search, but it’s offered by twistynoodle.com. I printed out several pages for my daughter’s teacher to offer her students. Did I mention that my daughter was super excited? Super duper excited! I’m hoping that my daughter is currently having a wonderful day at school celebrating a great author’s birthday. Here’s to you Dr. Seuss and thanks for all the lessons! I’m always telling/teaching my daughters that they should appreciate all that they have. My parents provided me with a home, clothes, food, and unconditional love. I never had a problem understanding boundaries and consequences. I knew exactly what would happen if I did something wrong so I just didn’t do it. For me, it was just that simple. I also knew that if I needed something it would be provided by my parents, but I never took advantage of that or them. I even went to a reasonably priced (since my parents were paying the tuition), nearby college (Lehman College in Bronx, NY) so I could commute without having to pay for room and board. I didn’t want to give my parents a college debt, especially since I really didn’t want to go, but I knew it was in my best interest. I can only hope that my daughters grow up with the same mentality with the exception of genuinely wanting to go to school and surpassing their own expectations.